HONOLULU, Hawaii, November 17, 2010 (ENS) – Fewer than 170 Hawaiian false killer whales remain in the wild and today the National Marine Fisheries Service proposed to list the marine mammal as endangered under the federal Endangered Species Act. The agency made the proposal in response to an October 2009 petition to list the population from the Natural Resources Defense Council. 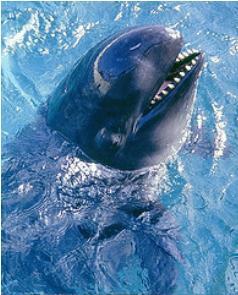 Hawaiian false killer whales, Pseudorca crassidens, are large members of the dolphin family. Females can grow up to 15 feet and males can reach 20 feet and weigh up to 1,500 pounds. They are pelagic animals that tend to prefer deep, open water. They are found in all tropical and warm-temperate oceans of the world, but the Hawaiian inshore population is the only one of the entire species known to make its home near land. “This indicates not only the uniqueness of the population, but also the biological importance of Hawaiian waters as an oasis for marine mammals,” the NRDC said today. The range of the Hawaiian false killer whale population range extends 87 miles from the main Hawaiian Islands, with its core in the area from shore to 25 miles out. Research shows that Hawaiian false killer whales establish long-term bonds within their species, sometimes mating for up to 20 years, says the NRDC. 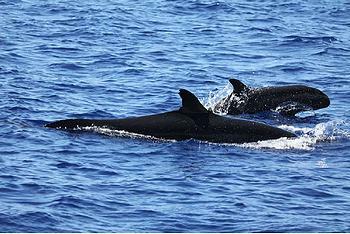 But only 46 of the Hawaiian false killer whales are capable of breeding, the Fisheries Service said today. “Animals’ offspring can be prone to genetic defects when their breeding population size falls to about 50 individuals,” the agency said in its listing proposal. Top predators, feeding off fish and squid, these false killer whales display unique feeding habits that promote trust among members of their pod by passing prey back and forth with fellow hunting partners before consuming the catch, said the NRDC. The Fisheries Service said its peer-reviewed analysis has identified 29 threats to the species’ survival, such as their small numbers as well as hooking and entanglement of false killer whales in fisheries. Under the endangered species listing, the government would have to identify critical habitat for the population, ensure that government activities do not jeopardize its survival, and prepare a recovery plan to bring the population back from the brink of extinction. The Fisheries Service is currently evaluating the draft plan and will soon publish the plan, any proposed changes, and a proposed rule for public comment in the Federal Register. The Fisheries Service is accepting public comments on the proposed listing through February 15, 2011. A public hearing will be held January 20, 2011 at the McCoy Pavilion at Ala Moana Park in Honolulu. Submit comments online via the Federal eRulemaking Portal at http://www.regulations.gov. The Fisheries Service will review comments and issue a final rule, expected by October 2011. Should the agency decide to finalize the listing, the Hawaiian false killer whale would become only the fourth U.S. whale or dolphin population to appear on the endangered species list since its inception in 1970.